No Guts, No Glory was given a 5-star review from popular book review site Readers' Favorite. Read their review below. Jim Bolen is a true American badass. He's led a life so on-the-edge dangerous that the details of it will make you insist — as everyone else has — that he shouldn't have made it through. No Guts, No Glory is the hard-knuckle first-hand account of a man whose fierce dedication to justice and fearless sense of adventure have taken him from the streets of Dayton, Ohio to the jungles of Cambodia; from leading enemy POW "snatches" in the military's top-secret Special Operations Group to being Hustler Magazine founder Larry Flynt's personal bodyguard; from squaring off nightly in a long string of "Road House"-style bar fights to becoming a South African bounty hunter, getting paid per head for each terrorist he captured or killed. And that's only scratching the surface. There is plenty more action as well, including an international gun-running scheme that ends badly, and business adventures that eventually make him a millionaire. Plus all the blood, guts, motorcycles, women and jail time that come with the territory. It's all there, and well-detailed in Bolen's straight-forward and unadulterated prose — which is further brought to life with hundreds of corroborating photographs, military citations, awards and medals. If you think he's bluffing about any of this, think again. For readers of nonfiction action and adventure, combat stories, international intrigue, and just plain Fight Club-style grit and humor, No Guts, No Glory is a must-read. "No Guts, No Glory is my favorite kind of military non-fiction. It is a history told from the perspective of the man on the ground. Not a retired general, not an historian who has never seen action, but a man who was right there in the middle of things. I found it funny, insightful, entertaining, and realistic. Jim is a man of action, but he also has a way with words. 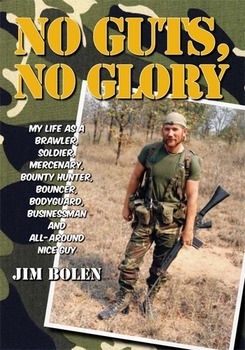 If you want to know what a modern day life of action, duty, and service looks like, pull your head out of those exaggerated novels and read No Guts, No Glory by Jim Bolen."